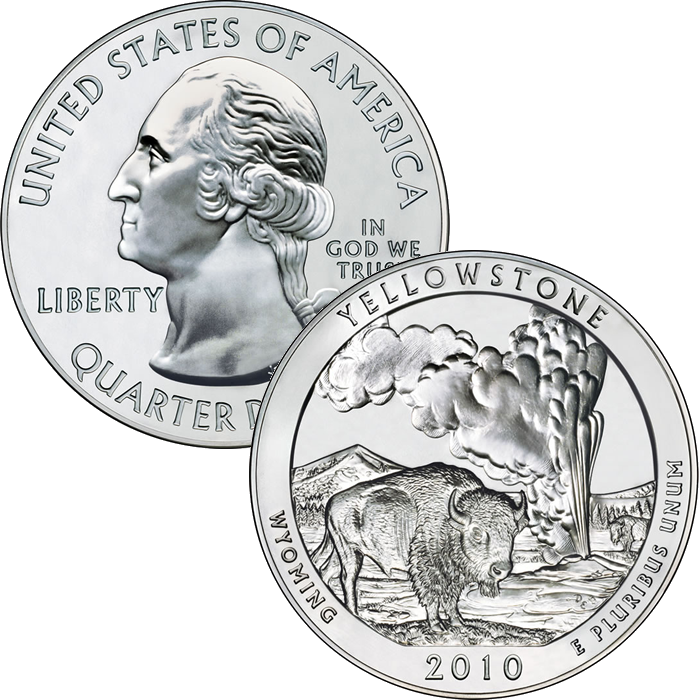 Honoring a national park located mostly in Wyoming, the 2010 Yellowstone National Park 5 oz Silver Bullion Coin will be released by the US Mint as a companion to the circulating quarter dollar also issued in 2010 and featuring the same location with identical imagery. What makes the silver bullion coins unique from the circulating quarter dollars is their composition and their size. Each coin in the series will be struck from five ounces of .999 fine silver and features a diameter of three inches. This makes these new bullion coin series the largest ever produced by the US Mint. 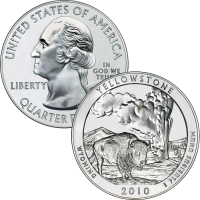 The Yellowstone coin marks the second of fifty-six to be created in the America the Beautiful Silver Bullion Coin™ series scheduled to run until 2021. These five locations honor sites found in the states of Arkansas, Wyoming, California, Arizona and Oregon, respectively. The same legislation that authorized the America the Beautiful Quarters™ Program authorized these bullion coins and dictates that the bullion pieces are released in the same year as their corresponding quarter dollar. Late 2010 to Mint’s network of authorized purchasers. Based on current melt value of each coin, plus a small premium. Philadelphia, although no mintmark is present on bullion strikes. As found on the circulating quarter dollars, the obverse (heads side) will feature a portrait of the First President of the United States, George Washington. The design was the original work of John Flanagan. Don Everhart designed and sculpted the reverse (tails side) image of the Yellowstone coin to show some of the most iconic features of the national park. Shown are the Old Faithful Geyser, two American Bison (buffalo) and a landscape indicative of the area.